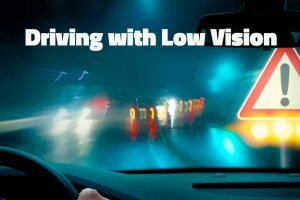 Driving with Bioptics for Low VisionThe doctors of Shore Family Eyecare acknowledge that driving is not a right but a privilege and find Issues related to public safety are of primary concern. However, access to driving privileges should not categorically bedenied to individuals with reduced visual acuity. Driving privileges should be allowed for individuals with adequate residual vision and cognition, who demonstrate the abilities to be a qualified, competent driver. Current figures vary significantly, based on the criteria used to define visual impairment, as to how many Americans are visually impaired. With this in mind, it has been estimated that there are between 3.4 and 16.5 million Americans who are visually impaired today. The majority of these individuals have distance visual acuity in the 20/50 to 20/200 range. Bioptic telescopes are spectacle mounted devices that magnify distant objects. They are permanently fixed on a spectacle carrier lens fabricated to the patient’s conventional prescription (and tint, when appropriate). Bioptic telescopes are mounted off axis, usually in the superior position but, depending on the patient’s need, may be fixed in other positions. A bioptic telescope allows patients to see through the carrier lens and to look through the bioptically placed telescope as needed. Bioptic telescopes are very important for patients who are employed or looking for employment and students. A bioptic telescope can also aid a person in traveling, allowing them to see street sights and traveling information. This is very important for our patients to maintain or improve their level of independence. Visual acuity alone may be a useful quantitative measure, but does not provide a qualitative measure of the multifaceted visual skills that impact driving. Abilities related to visual field, color perception, contrast discrimination, photosensitivity and glare recovery, oculomotor skills, etc., along with cognitive factors vary significantly amongst individuals with a visual impairment, suggesting the need for thorough evaluation and individual consideration by a low vision optometrist and a certified low vision driving instructor. Figures vary concerning how many states permit driving with bioptic telescopic lenses. However, most reports indicate that around 2/3 of states permit driving with a bioptic telescope. Obtaining bioptic telescopicspectacles does not guarantee that an individual will be granted a driver’s license in those states. The effectiveness of an individual’s visual and functional performance with the bioptic telescopic system should be the determining factor for the licensing agency on a case-by- case basis. 1. Restricted license – e.g. daytime only, limited distance, limited purpose or excluding freeway use, etc. A restricted license, depending on state regulations, may be granted to individuals with spectacle acuity of 20/40 to 20/200 in the better eye. Some states have a minimum monocular and/or binocular visual field requirement. 2. Bioptic Telescopic System License – specifications are not uniform in the 34 states that license bioptic drivers. The minimum acuity allowable through the telescopic system may be 20/70, however most states specify corrected acuity with the telescope to fall in the 20/30 to 20/50 range. Distance visual acuity through the carrier lens also varies from state to state, with 20/100 to 20/200 being most common. 3. License by individual review – in some states, individuals with visual acuity or visual field limitations can acquire restricted or unrestricted driving privileges based on their demonstrated ability to safely operate a motor vehicle. These states allow individualized privileges to a visual acuity level of 20/200. Some individuals may obtain licenses that are a combination of these types. License renewal policies vary widely from state to state. NJ allows for driving with a bioptic during daylight hours only and is used exclusively for reading signs and not solely for operation of a vehicle. Patients that wish to pursue bioptic driving must attend an extensive training program to be permitted to drive. Performance with a bioptic telescope for driving cannot be assessed in our office alone, as opposed to performance on the road (dynamic) with a trained instructor. For instance, the visual field available while driving cannot be assessed in office versus while on the move in a vehicle. Currently there are no specifics regarding the power of the telescope and the type of visual field loss and how this can affect driving. NJ requires a minimum visual acuity of 20/200 in the carrier lens and 20/50 through the telescope. It is our duty as physicians to offer help when available and advise ethically. If you or a family member have a visual impairment and are interested in learning more, please contact our office.